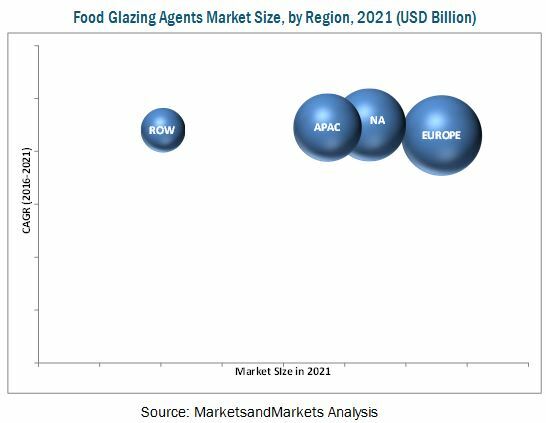 The food glazing agents market was valued at USD 2.27 Billion in 2015, and is projected to reach USD 3.74 Billion by 2021, at a CAGR of 8.8% from 2016. The market has been segmented on the basis of ingredient type, ingredient function, application, and region. This report includes an estimation of market size in terms of value (USD million). 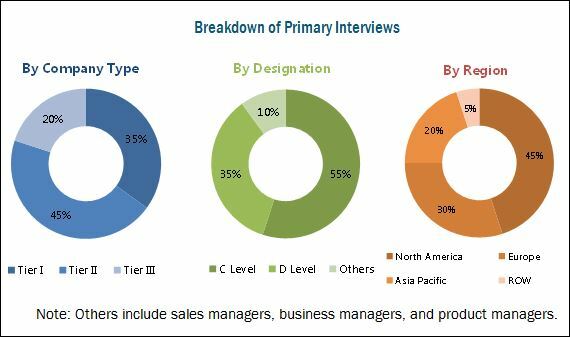 Both, top-down and bottom-up approaches have been used to estimate and validate the size of the food glazing agents market and various other dependent submarkets in the overall market. Key players in the market have been identified through secondary research such as Hoovers, Forbes, and Bloomberg Businessweek; company websites; annual reports; and their market share in respective regions has been determined through primary and secondary research. All percentage shares, splits, and breakdowns have been determined using secondary sources and verified through primary sources. The key players involved in market include Mantrose-Haeuser (U.S.), Capol (Germany), Strahl & Pitsch (U.S.), and Masterol Foods (Australia). This research report categorizes the food glazing agents market based on ingredient type, ingredient function, application, and region. Further breakdown of the Rest of Asia-Pacific food glazing agents market into South Korea, Indonesia, and Malaysia. Further breakdown of the RoW food glazing agents market into Chile, Argentina, and Middle Eastern countries. The market for food glazing agents is projected to reach USD 3.74 Billion by 2021, at a CAGR of about 8.8% from 2016 to 2021. This market is fueled by the growing interest among consumers towards the appearance and texture of foods and the growth of end-use applications of glazing agents in the food industry. Globally, the growth of bakery and confectionery industry has led to a large-scale adoption of food glazing agents for various applications. The global market is segmented on the basis of ingredient type into stearic acid, beeswax, carnauba wax, candelilla wax, shellac, paraffin wax, and others. The carnauba wax segment is projected to grow at the highest rate in terms of value and volume, during the forecast period. This is attributed to the increasing consumers’ demand for vegan and organic sources of food additives used in their food products. On the basis of ingredient function, the market is segmented into coating agents, surface-finishing agents, firming agents, film-formers, and others. On the basis of application, it is segmented into bakery, confectionery, processed meat, poultry & fish, fruits & vegetables, functional foods, and others. On the basis of application, the functional foods segment is projected to grow at the highest rate due to its benefits in the overall development of human body and other health benefits associated with it. The confectionery segment dominated the food glazing agents market due to the growth of the confectionery industry, which in turn increases the demand for this market. The market is also segmented on the basis of region into North America, Europe, Asia-Pacific, and the Rest of the World (RoW). In 2015, Europe dominated the global food glazing agents market, in terms of value, due to the developed food processing industry in the region. Asia-Pacific is projected to be the fastest-growing region in this market in terms of volume, due to continuous increase in demand for food glazing agents owing to the increased demand from different end-use applications. The multi-functionality of food glazing agents, coupled with the growing demand from the food & beverage industry drives the market. However, the increasing costs of raw materials is restraining the market. The global market is fragmented and competitive, with a large number of players operating at regional and local levels. The key players in the market adopted new product launches as their preferred growth strategy. Key players such as Mantrose-Haeuser Co., Inc. (U.S.), Capol GmbH (Germany), Strahl & Pitsch, Inc. (U.S.), and Masterol Foods (Australia) have been profiled in the report.